comfortable with back to back. JUNE 22- MAGGIE GLYNN- SHOW AND GENERAL HORSEMANSHIP CLINIC- 2, HALF DAY CLINICS- 9-12pm & 1-4pm- Will be covering things associated with show classes at Fun Country Riders Shows. @ Lausen Indoor Arena. Deposits Payable for Clinic Participation. Since the initial resolution passed in 2011 and amendments afterward regarding deposits being required prior to participation in a Clinic, there has been a great deal of discussion about the easiest and fairest way to have a member pay a deposit prior to participating in a clinic sponsored by Fun Country. Other clubs have this requirement because of the cost of obtaining clinicians and arenas. 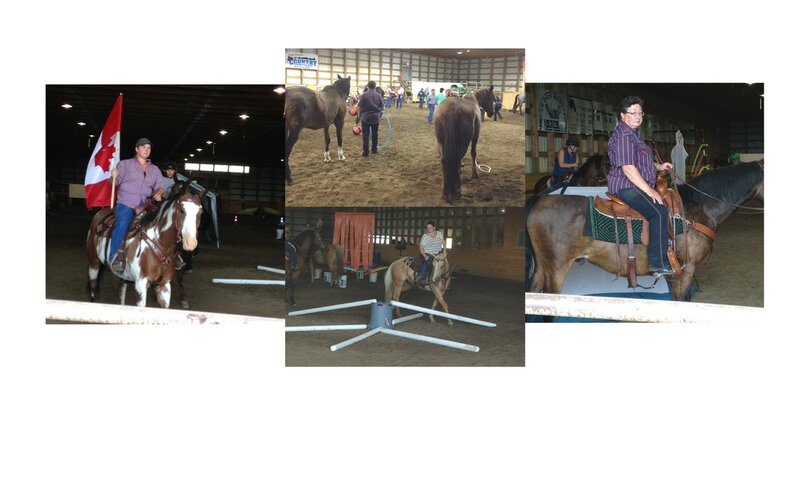 If a member signs up and does not cancel with adequate notification for someone else to participate, and does not have a very good last-minute reason for not attending (for example: a sick horse, or a broken truck or trailer), the Club still has to pay for the clinician and arena no matter how many people show up to participate. This has happened on a few occasions in the past couple of years, and it has been felt that we need to have a deposit on hand to apply to the cost if the missing member does not give adequate notice or have a very good reason for not attending..
(1) that anyone interested in attending any clinics held by Fun Country Riding Club of Strathmore must provide to the Club at the time of signing up for clinics, a $100.00 deposit payable by cheque, bank draft or cash to the Treasurer to be held by her without her depositing it to the Club's account;also payable is the clinic fee, to be paid at the latest, the meeting prior to the clinic. (4) if a member misses a clinic without proper notification or adequate reason and his or her $100.00 deposit is used, he or she will be required to pay another $100.00 deposit for future clinics for which that member is signed up, passed by the majority of members present at the Meeting. To be eligible to attend clinics, members must have paid their annual FCR membership fee and have an AEF membership in good standing. A refundable cheque for $100 payable to Fun Country Riders for non-cancellation notice must be provided when you sign up for any clinics.One $100 cheque for each participant payable to Fun Country Riding Club. A cheque for kids is not required if the parents already have provided one for clinics they are attending. Payments can be made at our monthly meetings,or drop off at Bubbles Laundromat in Strathmore or contact the clinic coordinators to make alternate arrangements. Lunch, snacks and refreshments are provided free of charge at each clinic. Parents/legal guardians of kids must sign a liability waiver at the arena where the clinic is being held. A parent or responsible adult must accompany kids to their clinics. We have a rule in place that if a rider knows that his or her horse may kick, there should be a red ribbon in the horse’s trail as a warning to other riders and people who are walking around. Bea purchased a couple of rolls of thin red ribbon, a pair of scissors and a small container to keep them in, from a Dollar Store. These will be kept in the green box with the other supplies to help out riders who forgot to bring a ribbon, or who just found out that his or her horse kicks. Please note Fun Country does not allow stallions. We will have our handy Cookbooks to sell at Club activities throughout the year. You can contact Angela to get a copy or pick one up when you come to a Meeting. The cost is only $10.00 each (no GST).